I love it, how your contrast work in this piece, is very nice touched and smooth. 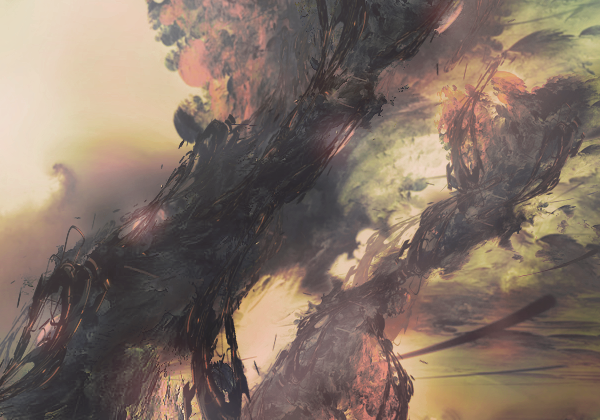 The depth you made is very on nice level, I like how you manipulated C4D’s in this piece. Everything has own place and you made it very professionally. The red, with yellow has nice transition between green gloomy I noticed here. Once again, good work but you should try to smudge some environments in the background between two pillars, I think it’s a little too chaos there, but ye looks good tho. Thanks, Cael. You know, I wasn't super confident in the contrast. I've never been too strong in having really well done contrast in colors, unlike quite a few other people around here, so I'm actually pretty glad to hear someone's fond of it. The C4D was generously provided by Kadachi after I blew his DMs about trying to get it, so I was excited to make use of them (which just so coincidentally worked perfectly for this one). Most of the color work was achieved through [Only registered and activated users can see links. ]than I care to admit, but thankfully it kind of worked out in the end. Trying to smudge some background environments could definitely make for some interest addition. I was initially going to try and work a render in there somehow, but never ended up making an effort to find one that could work.